Pick up a cane rocking chair, a writing desk with intricate artwork or a gramophone. Dakhinapan has interesting art deco pieces, beautiful mirrors and a tasteful selection of furniture waiting to be discovered. Have a mooch around the spacious galleries and you’re sure to fall in love with more items than you can carry back! You will find all kinds of furniture pieces inside and outside the showrooms. A quick rummage will reveal plenty to add style and character to your home. We loved these small tables, perfect for corners to keep a stack of books. Most of them had drawers as well for any stuff you may want to store. The intricate paintwork is delicate and will add a touch of colour to any room. You can keep knick-knacks and jewelry in these small cabinets and chest of drawers. The elephant table is for INR 3.304, the samovar is for INR 8,900. and the little cabinet is for INR 4,500. You can pick these up from Mrignayani. Have you always fancied a rocking chair? We can hear a “hell yes!” kind of response. We love them – they turn any corner or patio into an instantly cosy crawl space. There’s something soothing and relaxing about spending time in a rocking chair. It’s an ideal spot to read, chat or even to catch a quick nap. This one is a steal at just INR 5,069 at the Tripura Emporium – it will make you want to curl up with a book with a cup of hot chocolate. Dakhinapan has all kinds of seating arrangements – from cosy chairs for conquering that crossword to mooras to put your feet up. Dakhinapan stocks a colourful selection of furniture and decorative objects, and some truly unique pieces. 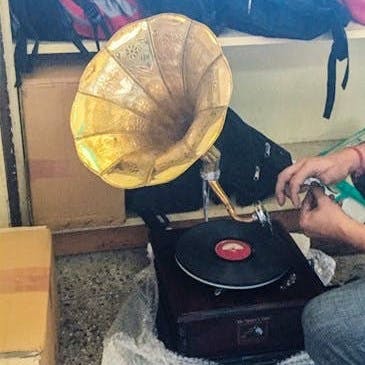 We came across this gramophone outside the Madhya Pradesh showroom, Mrignayani. They are bought by the store and repaired. And they work! So go ahead, dig out those old LPs (or pick up a few from Free School Street pavement stalls), put on a Naushad or an OP Nayyar number and enjoy a lazy Sunday. At INR 5,040, these make for great wedding presents or a special anniversary present for your folks. Ever wondered where old bicycle bells go to die? Perhaps to add a dash of quirk to an eco-chic trendsetting home in the form of this funky turtle (INR 450)? Pick up these fun pieces of decor for the house made from salvaged materials at Aranya, a store tucked away in the upper area of the complex. They combine art and trash into truly unique creations – like this bird fashioned from a discarded bicycle seat frame. If it is furnishings you are looking for, you will be spoilt for choice here. Most of the state emporia sell rugs, curtains and bed linen in different local designs. We found these with colourful geometric patterns (just INR 840 at Poompuhar, the Tamil Nadu emporium). Before you pick one up, figure out first where you will put it – if it will the rug be in a high-traffic area like an entrance hall (look for bold prints and durability), consider the scale of the room. At the entrance to Dakhinapan, to your left are stalls selling bed covers in pale pastels (INR 500 to 700 for a double). Head to The Art Furniture (strange name for a shop that stocks mostly ceramics!) to stock up your kitchenware. It is one of the few remaining places in Kolkata that still stocks the signature blue-and-white Domit range of ovenware.